Leo has contributed to VMX Magazine for several years (his first article was in Issue #19) and is particularly active in the German vinduro scene. He also does some great historical features on German marques from yesteryear. Born in 1951 in Aachen, Germany, Leo’s first offroad contact came via a 1,5 hp Rabeneick moped. That brought so much fun that he started enduro competition in 1972 on a 125 cc Hercules-Sachs. In 1980, Leo finished his ‘racing career’ (“it has brought much more fun than podiums” Leo remarked) and in the following years he travelled around Europe with his BMW street bikes. About ten years later he found some 1972 Hercules enduro parts and began to collect and restore Hercules off road bikes. It was the time when the Isny MC held its first vintage enduro and Leo could turn back the clock and started riding vintage bikes (Hercules of course). Some years later he got in touch with Speedy Clasen, who invited him to come to the 2001 Reunion Ride in Park Hills/MO – the first of three ISDT Reunion Rides that Leo has undertaken in the USA. 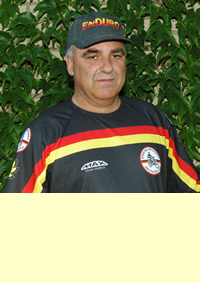 Leo also has managed to author three books: “Gelaendesportmotorraeder”, “Typenkompass KTM”, “Typenkompass Enduros and Gelaendemotorraeder – Germany and Austria”. Leo also writes for other Magazines: ENDURO, KLASSIK MOTORRAD “GS” (Andreas’ new magazine).